I don’t know, for some people paper piecing seem like the most easy thing to make. Not for me. I haven’t tried it that much, but every time it’s difficult, I kind to have to think backwards or something. And no matter how hard I think 😉 I still have to rip out a seam here and there. This is todays effort: I copied the pattern from Valori Wells’ book without enlarge it so the points are rather tiny. And I still haven’t mastered of stopping the machine at one exact on the mm point, hence the uneven peaks. But practise makes, well if not perfect, at least better. Will have a go at it tomorrow again. I usually stay confused until I make one then my brain kicks in. You can shorten your stitch length a little when working with something small. That helps you to be able to stop where you need to and you don’t over shoot your stopping point. I think it turned out nice. Thanks for the input, will try it tomorrow. You don’t have to start and stop at a specific point! Actually it is easier and better is you do not. Basically, stitch each line a few stitches before the start of the line and a few stitches after the end of the line. You can add a securing stitch each end if you really wanted to but really not necessary as the lines that cross these ends will secure them. What you will find by doing this is that when you have to trim a seam to a 1/4″ seam allowance previous line that have crossed it will stop the fabric folding back from the paper . Just pull back and tearing the paper from those stitches to allow you to have the seam lay straight to cut. Not easy to explain but once you try it it will make sense. Then it will make sewing the lines a breeze. Yeayyy – you are back, how great to hear from you – everything OK? Thanks for this, I liked how neat the seams turned out when she folded back the paper and cut them…Practise, practise…. 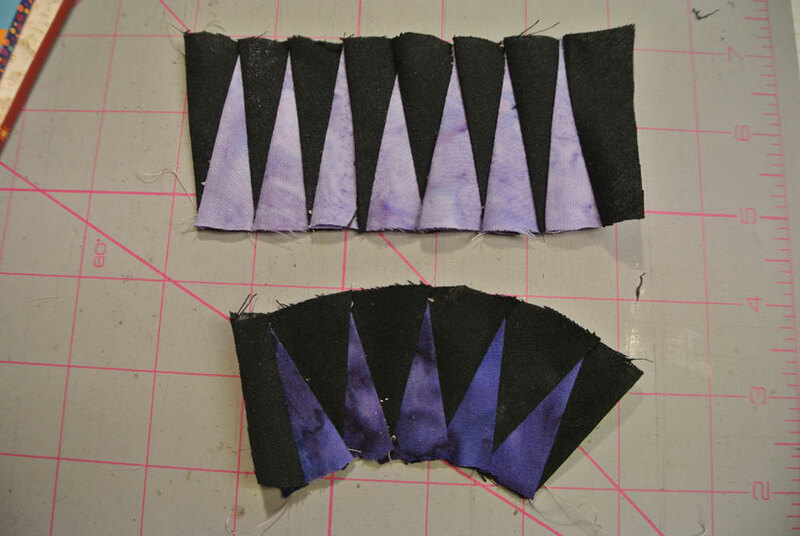 It is always the first 2 pieces that cause the confusion… after that … there is only one piece to put down and stitch. Your practice pieces are looking good, and I see others are offering GREAT advice! Keep going!